Damn, you just make it seem like Austin's skyline is THAT bad. It's not just my opinion, obviously. It wouldn't even be on the list, don't you think? Ah, pie-in-the sky renderings from 2007 when the real estate market was still in an unsustainable bubble. Charlotte skyline is only one street (Tryon). Outside that street there is nothing that even looks like a city. Nice buildings, and an OK picture taken from certain angles, but not much of skyline. Don't know what you are looking at, but it sure looks like it spreads beyond "one street" to me! I always though that Detroit was fairly comparable to Charlotte in terms of the skyline. However it's no doubt that in the near future Charlotte will grow to well beyond Detroit. Perhaps they are comparable in terms of height and the amount of buildings, but not so much in terms of orientation, architecture, and density. I was referring more to the height and size. I don't see a whole lot of cities with similar architecture that aren't either way bigger or smaller. I've been to Detriot several times. 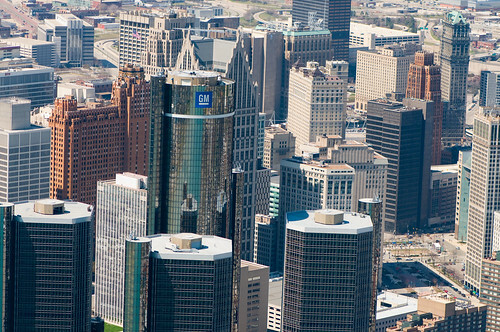 With the exception of the hulking Ren Cen development, most of their buildings are smaller, older buildings. Buildings back in the day apparently had smaller foot prints and you can definitly see that in Detroit. I'm not saying that the smaller sized buildings are a bad thing, I think it helps make Detroit more dense. I'm just saying the majority of their buildings are on a much smaller scale than what you see in cities with more newer buildings like Charlotte. Point I'm making is that, seeing the city with my own eyes, I didn't think Detroit looked anything like Charlotte. Okay you obviousily misunderstood 2/3 of what i was sayin and all you did was defer from the subject im a reply that was off topic. So please take in consideration i am on my phone and for me to reply with all that i want to say would take entirly too long. Location: The Brazos River runs thru it. A lot of the towers are indeed clustered along Tryon, but College and Church streets, which run parallel to Tryon to the east and west respectively, also contain a nice number of towers. You probably only think our skyline consists of one street because our tallest towers are mainly oriented in a north-south fashion, but your assessment still would not be accurate. Furthermore, there are other highrises that don't even show up in many of the typical skyline shots. Um, my assessment is accurate. I know Charlotte very well. Yes, there are two to three street that are just off of Tryon, but they are so close to Tryon it might as well be a single street (if measured by major cities sized streets). You can walk downtown Charlotte from one end to the other in minutes. It is VERY SMALL and is basically a small town with big city high rises. Anyone who has lived in a real city and in Charlotte shares the same opinion. And the Skyline just isn't that impressive. Sorry. Um, my assessment is accurate. I know Charlotte very well. Yes, there are two to three street that are just off of Tryon, but they are so close to Tryon it might as well be a single street (if measured by major cities sized streets). Oh, I see. "The skyline really is located along a couple of other streets as you correctly stated, but they don't count because Charlotte isn't the size of New York, Chicago, or San Francisco." ROFL!!!!! Whatever dude. I proved you wrong and provided visuals. You can't argue with that. I mean you can, but they just make you look delirious if you do. You can walk downtown Charlotte from one end to the other in minutes. Oh really? You DO know that downtown (we call it uptown) Charlotte is everything within the I-277 loop and consists of four wards, right? Try walking from the Blake Hotel in 2nd Ward all the way to JWU's campus in 3rd Ward. Or try walking from Little Rock AME Zion Church in First Ward to Bank of America Stadium. Those aren't the short walks you're making them out to be at all. It is VERY SMALL and is basically a small town with big city high rises. You're simply in the minority if you consider a city of 280 sq miles and closing in on 700,000 people that anchors a metropolitan area of over 1.7 million (and a CSA of over 2 million) a "small town." But hey, maybe we're better off having people consider us a "small town," considering the fact that we're home to two major league professional teams, light rail, several F500 companies, a burgeoning skyline (with "big city high rises" as you state) with over 20 million sq ft of office space, etc. Man, that's TONS more than the town of roughly 300 people I spent most of my childhood in. I thought THAT was a small town, but apparently, they aren't doing enough to warrant that designation yet especially since they don't have "big city high rises." Anyone who has lived in a real city and in Charlotte shares the same opinion. What is a "real city"? Does that mean Charlotte is a "fake city"? And if you knew anything about Charlotte as you claim you do, you'd know that we've got more than our fair share of New Yorkers here, and while they know we're FAAARRRRRR from being New York, they know we're not a "small town" either. So, you're wrong. Everyone does not share your narrow, biased, ignorant opinion. You're lying. And the Skyline just isn't that impressive. Sorry. For a "small town" it sure is. Show me how many other "small towns" across the nation have a skyline like ours. And if you show pictures of Denver or Minneapolis or Seattle or Cleveland, then your definition of "small town" is radically different than that of normal people. In short, your assessment is as wrong as two left shoes and you know very little about Charlotte. Brother, you just cannot please some people. No matter what you say! Not even worth explaining. I asked the same guy to show me what cities Charlotte's skyline compares to and then we would call them all "small". But, nothing but silence, of course.